Late June or early July is a common time for non-monthly bills like real estate taxes or insurance bills. I’ll be paying my yearly city trash removal bill in July. I save 10% by paying it yearly instead of monthly. Planning ahead with a sinking fund can help you save on some bills. Are you planning to do something special for your dad or another father figure in your life? It’s coming up very soon! 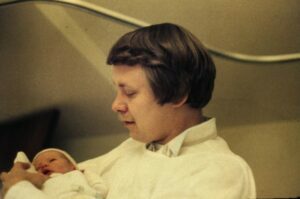 Me and my dad, the day I was born. June is a very popular time for weddings. Be sure to plan for any gifts, clothing, or travel you’re going to need for any weddings. What? Why would you worry about Christmas in June? Well, if you have a Christmas sinking fund, it should be about halfway full. If you’re not there yet, maybe think about doing some things to beef up your savings now. 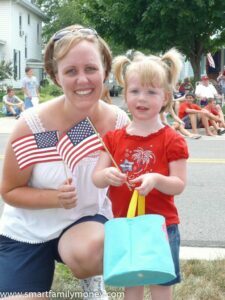 If you’re planning any celebrations for the 4th of July, it’s best to budget for them in June so you can prepare. 4th of July is one of my favorite holidays! Most Americans spend more time traveling in the summer, so make sure you’re budgeting a little extra in your fuel budget! Many farmers’ markets start back up at the beginning of June. If you plan to attend, be sure to have the money for it. What did I miss? 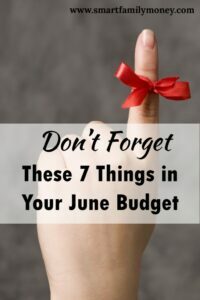 What are you including in your June budget? Comment below!